Inspired by the Copenhagen interpretation of quantum mechanics, the author introduces two axioms, one for measurement and the other for causality, to establish a new paradigm or world-description called "linguistic interpretation" or "quantum language". The paradigm casts a new light on the wellknown problems in quantum mechanics including Heisenberg's uncertainty principle, EPR-paradox, Bell's inequality, Schrödinger's cat (Wigner's friend), Wheeler's delayed choice experiment, and double-slit experiment. He shows that the paradigm works not only in quantum systems but also in classical systems, referring to regression analysis and Kalman filter in statistics and so on. He emphasizes the paradigm is a natural consequence in the history of philosophy, and shows how the famous problems in philosophy are solved such as Leibniz=Clarke correspondence "What is space-time ? ", Zeno's paradox , and the principle of equal probability. He thus leads us to a conclusion that quantum language is a core concept of science. This is a note of my lecture for graduate students which has been given for about 15 years at the faculty of science and technology of Keio University. The main theme of my lecture is "quantum language"(="measurement theory"), which was proposed by myself. Quantum language, inspired by the Copenhagen interpretation of quantum mechanics, is a powerful tool to describe classical systems as well as quantum systems. To do science is almost to describe phenomena in quantum language. Quantum language is most fundamental in science. This lecture note, an updated version for a course in 2015, may be regarded as a revised edition of the following two papers. : S. Ishikawa, Mathematical Foundations of Measurement Theory, Keio University Press Inc. 2006, (335 pages) . Recently I use "quantum language" more frequently. Dr. Shiro Ishikawa, former associate professor at Keio University, graduated from Keio University in 1971. His research covers functional analysis, foundation of quantum mechanics, and philosophy of science. 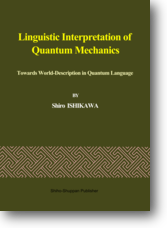 For further information about quantum language, see also (url: http://www.math.keio.ac.jp/~ishikawa/indexe.html ). Copyright © 2019 紫峰出版 All Rights Reserved.